1. 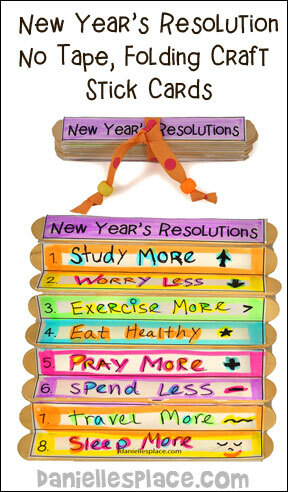 Before class print out the New Year's Resolution Pattern and make copies. 2. Cut rectangles the same size as the New Year's Resolution Pattern for the back of the craft sticks. 3. In class have your children use markers to write New Year's resolutions on the patterns, and decorate it with highlighter markers. 4. When they are done, have them line up nine mini-jumbo crafts sticks. 5. Show them how to spread glue on the back of pattern and then stick the pattern to the middle of the craft sticks pressing down and out from the middle of the paper. 6. Turn the craft sticks over and glue the blank piece of cardstock to the back. 7. Let the glue dry completely. This could take up to an hour. When the glue is completely dry use an Exacto knife or box cutter to cut the paper. (Adults Only!) On one side carefully cut the paper in the space between the first and second craft stick. (Do not cut all the way through to the paper to the other side.) Skip the next space and cut the space between the third and fourth craft sticks. Skip the next space and the top paper between the fifth and sixth craft sticks, and so on. 9. Carefully fold up the craft sticks. 10. To finish have your children add beads or other decorate items to a piece of string or yarn. Glue the string to the top of the craft so it can be hung up. 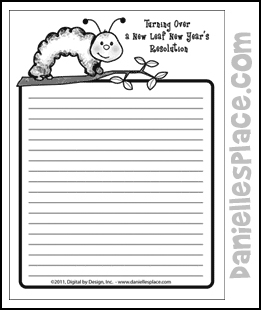 Turn over a new leaf with this adorable little inchworm! This pattern is available to members only. 2. 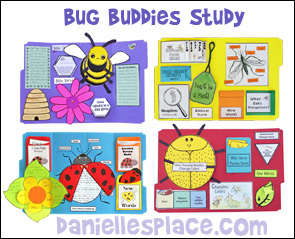 Staple the pages together to make a book. 3. Explain to your children that at idiom is a phrase or expression that means something different than what the words actually seem to say. Ask them if they have ever heard of the expression "I'm turning over a new leaf", and if they think they know what it means. 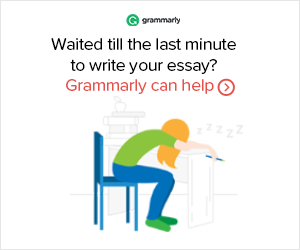 If you use the literal meaning, you would picture someone picking a new leaf from a tree and turning it over, but that isn't the meaning of the expression. The pages in books used to be called leaves. Some books were even written on actual leaves such as palm leaves. When you say you are "turning over a new leaf", you are saying that you are "turning a new page" or starting anew. You're no longer going to do what you did before. You are going to do something different or better, or write a new page in your life story. 4. Have your children think about what they would like to change in their life story, maybe something that they keep doing over and over that they know isn't good for them, maybe a bad habit, or something that bothers others, or something that keeps them from achieving their goals. Then have them write on the "Old Leaf" page of their book what they do that could cause a problem for them or others. And then on the"New Leaf" have them page write what they will do instead to change their life story or "turn over a new leaf". 1. Print out the pattern onto card stock. Cut around the edges of the card and fold it in half and unfold. 2. Color the smiley faces and then cut them out using an Exacto knife (Adults only). Cut around the outside of the smiley faces in the middle of the card leaving them connected between the tiny separating lines. 3. Fold the card in half again while pushing in on the smiley faces from the outside folded edge of the card. This will make the smiley faces pop out inside the card. Flatten out the folded card. 4. 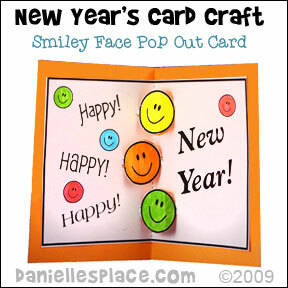 Glue the card to another piece of colorful card stock but do not glue where the smiley faces are. 5. To finish decorate the outside of the card with smiley face stickers or anything else you would like to use. 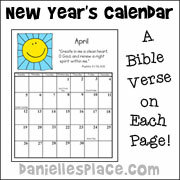 Use this calendar as an art project, history lesson, Bible lesson, and English lesson. 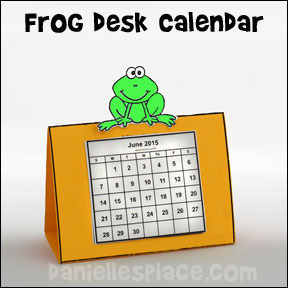 The printable pages for this calendar are available to members. 1. English and Art - Each month of this calendar has a new quote. Have your children read the quote from Benjamin Franklin and ask them to share what they think the quote means. Discuss the meaning of the quote and then have your children draw pictures that relate to the quote. 2. History - Learn about Benjamin Franklin - See our Benjamin Franklin Crafts and Learning Page for more ideas. 3. 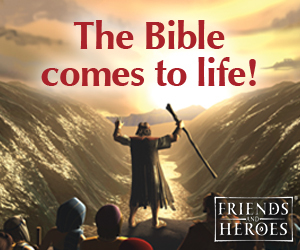 Biblical - Study the Benjamin Franklin quotes and then see if you can find Bible verse that go along with the quotes or talk about the same subject. 4. Math Review - Each month review how many days in a week, days in each month, weeks in a month, months in a year, etc. A printable sheet is available. This craft can be used any time of the year and would make great Christmas gifts. 2. Cut card stock 4 1/4" wide by 10" and fold it into a triangle shape as shown in the picture. Glue the triangle shape together. 3. 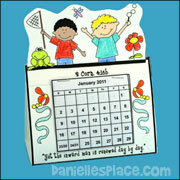 Draw pictures to glue to the top of the calendar or use stickers, or use pictures from other sources. 4. Glue the calendar pages to the triangle shape. 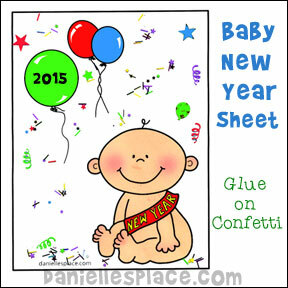 Celebrate the New Year with Fun Crafts - Make this cute New Years baby. All you need is paper and pretty confetti. 1. Print out the picture on to card stock and write the new year date on the balloon. 3. Spread a clear drying glue in the areas you want confetti. Sprinkle confetti over the glue. Place the bigger pieces of confetti to make it looked spread out evenly over the picture. Put more on the bottom of the picture so that it looks like it has fallen to the floor. 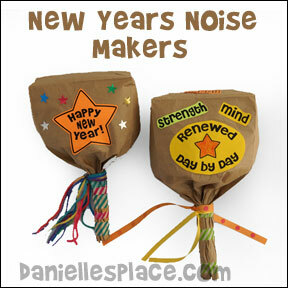 Children of all ages will love making these paper bag noise makers. They are super easy and cost only pennies to make. Warning - they are very loud. 1. Decorate the bottom third of a paper lunch bag with markers, crayons, paint, or colored pencils, and add decorative tape or stickers. 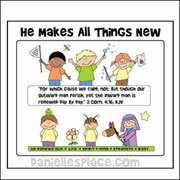 Patterns for this craft are available to members on the Bible Lesson - "All Things New" on The Resource Room. 2. Unfold the decorated paper bag and place another paper bag inside the decorated paper bag to give the noise makers strength. 4. To finish, gather up the sides of the paper bags smoothing them out as you crinkle them up. Spread out the tops of the bags and blow into them to puff out the bottom of the bags. When you have a good shape twist the bottom of the bags to make the handle of the noise makers. Use colorful tape such as duct tape or washi tape to decorate the handle and to keep it from unwinding. These hats can be used as a craft at your New Years Party or you can print the pattern out smaller and use them on your table as place setting. Just print the name of each person who attends your party on the back of the hat. 1. Print out the hat patterns and the hat toppers and cut them out. 2. Roll the hats into cone shapes, and glue the hat toppers to the hats. 3. 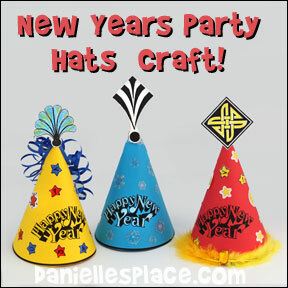 Glue the hats together and then glue on sequins or use glitter paint to decorate them. 1. Paint or spray paint a large grocery bag with gold or silver paint. Let it dry. 2. Print out the Happy New Year! pattern, cut it out, and color it. 3. Glue the pattern onto the front of the bag. 4. Tape gold and silver ribbon to the bottom of the bag so that it hangs down. 5. Fill the bag with goodies. 6. Tie the top of the bag closed. 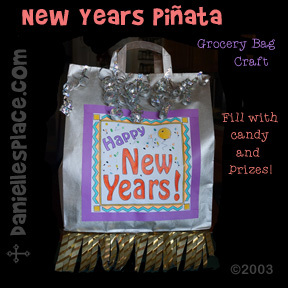 Punch a hole in the top and tie a string to the bag through the hole so that the piñata can be hung up.